Everything that is great has stood strong in the test of time. So is the case with the Ramayana. 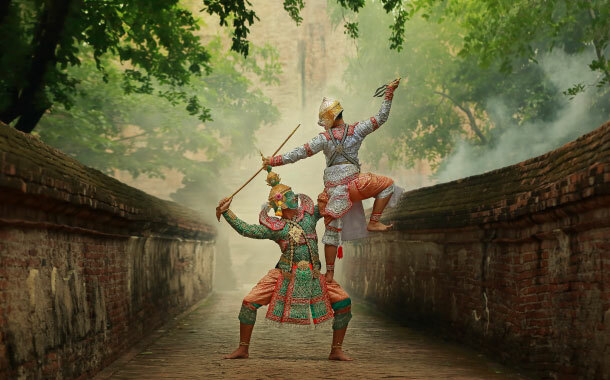 Our elders have been telling us the great stories from the mythological tale of the Ramayana, and the lack of sufficient evidence has left the Ramayana to be called an integral part of literature. But probably after reading this, you might want to hear the stories of the Ramayana all over again, from your elders and this time- in a different light. In Sigiriya, Sri Lanka there is a cave that has been tested by archaeologists to be a hundred percent natural. The mysterious part about this cave is that its shape, despite being untouched by human hands, has taken the shape of a cobra! Moreover, this cave still has cave paintings on its walls, depicting scenes of Sita being captured by the Asuras. Let’s rewind the story a bit and get to the point where Ram was sentenced to exile by his own father, Dasharatha on account of a promise that he made to his wife Kaikeyi. Being the obedient son that he was, Ram along with his beautiful wife Sita and his brother Lakshman proceeded to the forest; and the place where they built their cottage and lived for the next 14 years is stated to be ‘Panchavati ‘. Here’s where the surprising bit comes- there exists a place called Panchavati, near Nashik. It’s often claimed that this Panchavati is the same place where Ram, Sita and Lakshman made as their abode once they were exiled from the royal palace. Today this place has a lot of temples and is often visited by people. When Sita was abducted by Ravaana, there was a demi-god called Jatayu who came to Sita’s rescue. However, Ravaana slayed the demi god’s wings and he fell to the ground. Mean while, Ram and Lakshman found the now-dying demi-God who was lying on the ground. It was Jatayu who told Ram that it was Ravana who had abducted Sita and it was Lanka where Ram would find his beautiful wife. But alas, Jatayu could not be saved, as he was now breathing his last. In order to thank Jatayu for his brave efforts and for imparting the precious bit of information about Sita’s abduction - Ram, with his divine powers uttered the words ‘Le Pakshi’ which in telugu means - ‘Rise, Bird’. The fact here is that there is an actual place in Andhra Pradesh called ‘Lepakshi’, which is reportedly the place where the Jatayu fell. Jatayu, being a crucial part of saving Sita is highly revered in the Ramayana. When Ravaan abducted Sita and got her to his kingdom of Lanka, he is said to have first taken her to a place which is now a tourist spot in Sri lanka called Sita Kotuwa. 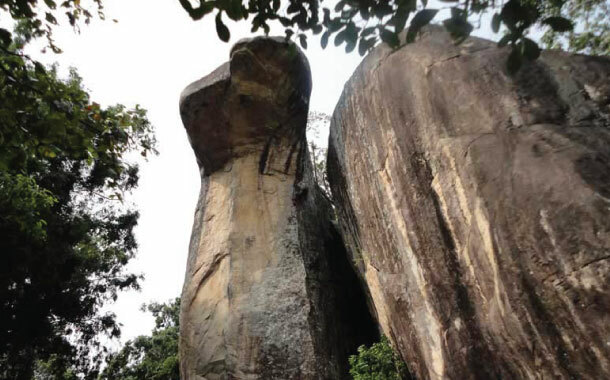 According to the mythological tale, from here Ravana took her to Ashok Vatika and surprise surprise- there is an actual ‘Ashokvanam’ in Sri Lanka. Don’t believe us? You don’t have to. You can book your flight tickets, get your Sri Lanka visa and check it out for yourself. Going by the mythological tale of The Ramayana, when Ram deployed the monkey forces to rescue his wife, Sita. He chose the strongest among them who was named Hanuman to find Sita’s exact location. Upon receiving blessings from Ram, the monkey God flew to Lanka to find the exact location of Sita. Full with power and divine blessing, Hanuman was endowed with a special ability to alter his form - i.e; he could maximize his size to that of a giant or even minimize his form to that of an average monkey! To support this- till date, there are footprints that have been said to be of Hanuman near Ashokvanam. These footprints differ in size and are a reflection of the special powers of the monkey God- Hanuman. A part of the Ramayana narrates that after Ravana found out that Hanuman had come to free Sita, he set Hanuman’s tail on fire after attempting to keep him captive. In the process, Hanuman set Ravaana’s kingdom on fire by jumping over distances and places which were a part of Ravana’s kingdom. Even today, in some parts where Ravaana’s palace once reportedly stood, the soil is somewhat darker than that of the surrounding area. 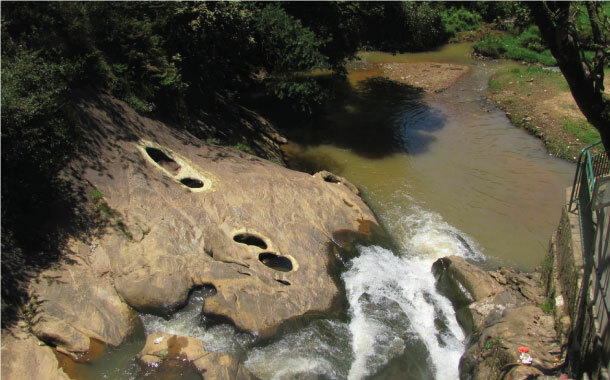 Said to be built by Ravaana, the hot springs are well-like structures which still exist and form an integral part of being Sri Lanka’s supply of naturally hot water. Whenever Ravana has to be depicted either in texts or sculptures, he is shown to be having 10 heads. While the statement that Ravaana has 10 heads might seem highly impossible, the fact that he ruled 10 kingdoms doesn’t seem far fetched. 10 kingdoms, 10 crowns. Simple. Another theory states that Ravana was a great scholar and his ten heads symbolise his mastery over 6 shastras and 4 vedas. One of the theories state that the ten heads of Ravan depict the 10 negative senses or emotions in a human being, namely- lust, anger, delusion, greed, pride, envy, the mind, intellect, will and ego. Although they didn’t require a Sri Lanka visa to travel there in those times, there was a huge problem in the form of the water bodies, that we now call as the Palk Strait and Gulf of Mannar. In order to get to Ravaan’s kingdom, Ram had to cross these water bodies. So, he ordered his supreme army of monkeys to build a bridge between the two lands, and with his divine power the stones floated on the water. With the help of Google maps and complex technology, if you carefully watch the Gulf of Mannar and the Palk Strait, one can actually see a link between the two countries! 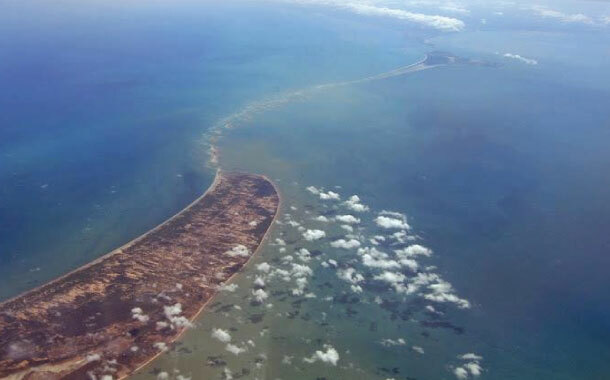 This link has often been dubbed as the Ram Setu or Rama’s bridge and even sometimes as the Adam’s bridge. Vijaya Dashami is the day Ravaana was defeated by Ram in an epic battle between the demons and the army of monkeys. Sita was rescued and Ram along with his trusted comrades took his wife back to his kingdom, Ayodhya. 21 days later, he returned to Ayodhya, and his return is why Diwali is celebrated with lights as it first was done by the natives of Ayodhya, to celebrate the defeat of darkness by light! Even in today’s day - The journey from these two lands takes a total of 21 days by foot, according to the much-trusted google Maps - which is pretty much the number of days from Vijaya Dashami to Diwali. Here is our story on how the Ramayana may actually be true or even maybe a little more than just being a mythological tale . In any scenario that this article arises or erases doubt- we’d like you to know that this is a mere speculation which may conveniently happen to be supported by the above pieces of information. We hope that doesn’t hinder your Diwali plans! None the less, here is an exciting international flight offer just for you.